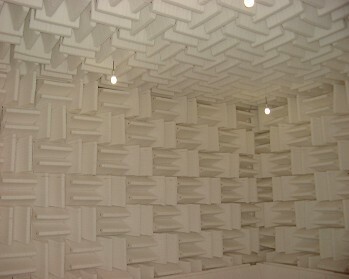 To control the external and the reflection sound to the minimum, the anechoic room is designed. The external noise and the reflection sound become the obstructions of the experiment. Therefore, to prevent an external noise, it is covered with the thick wall and the door, and to prevent the reflection sound, it installs the material of the wedge type in the internal wall as an sound absorber. In our laboratory, new material "Bell Recycle" that differs quite from the traditional glass wool is used as a sound absorber. 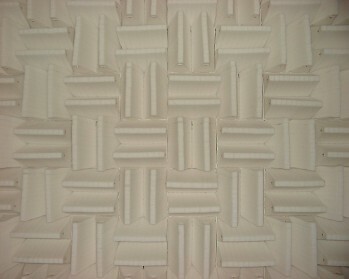 We adopted it for the material of the anechoic room for the first time in the world. "Bell Recycle" is a regenerated fiber material made from the PET bottle. 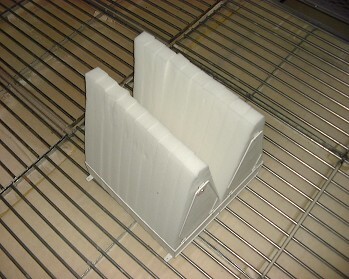 It is strong compared with mold and the bacteria and has the heat stability in mold.